"The war was over. The Americans in Germany who knew dogs were really taken by the dogs they were seeing, these great working animals. The pressure was on to sell Lex and it was finally done for $10,000 an unbelievable price for the time. Supposedly there was such a strong feeling about him getting out of the country that he was poisoned on the way out and he died." 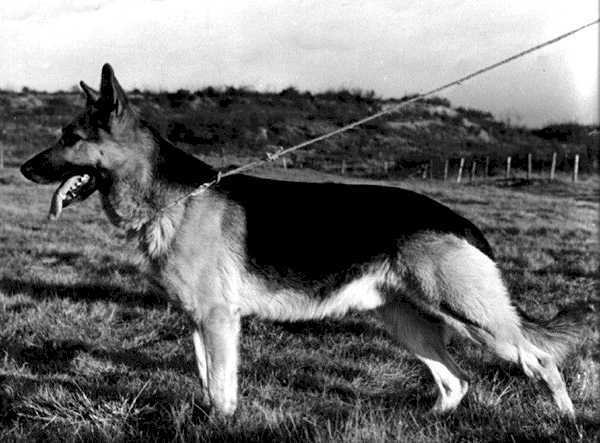 "Lex sired more VA stock than any other dog of his day and through his son VA Rolf Osnabrucker Land and other members of that 'R' Osnabrucker Land litter was to be widely bred to in Germany. Lex was particularly successful in producing strong heads, good fore assemblies and adequate hind angulation with good width of thigh. In the main he gave strong black and tan saddle marked stock but with this line came some tendency to colour paling. It also seems to be particularly prone to cryptorchid problems and many animals inbred on Lex or Rolf produced this. Some excess of body length and a tendecy to short forelegs can come via Lex as was seen in Danko stock but on the whole Lex was a valuable sire who might have been more widely used than Rolf and to better effect had he, Lex, not been poisoned in 1949 when still only five years old." This highly influential dog was poisoned and died at age 5!